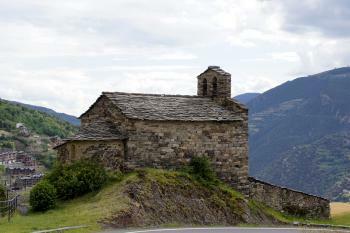 Eglises romanes d'Andorre is part of the Tentative list of Andorra in order to qualify for inclusion in the World Heritage List. During our visit in Andorra in May 2014, we visited five of the eight churches that are included in this tentative site. Their architectural style is similar to other Romanesque churches in the Pyrenees, but those in the Vall de Boi are far more beautiful and more impressive. I liked most Sant Miquel d'Engolasters and the small Sant Serni de Nagol (photo), which is very similar to the small hermitage in Durro/Vall de Boi. The other churches are located either at a busy road or in a town centre surrounded by ugly modern buildings, not to be compared with the scenery in the Vall de Boi. However, we did not visit the churches in Pal and La Cortinada, which are located in more remote side valleys. None of the churches was open to visitors. All in all, this tentative site would not add much to the WH list, Romanesque churches in the Pyrenees are very well represented by the Vall de Boi WHS. 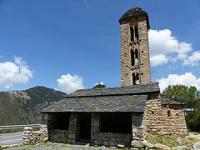 I visited the Church of Sant Miquel d'Engolasters by chance in May 2014 when visiting Andorra's only inscribed WHS. There are some information boards but its condition, its location close to the mountain pass and the fact that it's always pretty much closed didn't impress me much. The churches of the Vall de Boi in Spain are way better. I visited the 12th century romanesque Church of Sant Miquel d'Engolasters, which lies just outside the core zone of Andorra's only WHS so far. The little church is easy to spot as it stands close to the road that leads up to the Lake of Engolasters. It is one of 8 sites that together form this TWHS. It really is a minor site where a visit shouldn't take more then 5 minutes. The church door was locked so I didn't get in - but its original frescoes have been taken away long ago to the MNAC museum in Barcelona. Most interesting is its tall bell tower, which looks very vulnerable. One decent storm and the dry stone will crumble away. At the highest arch a sculpture representing a human face can be seen.